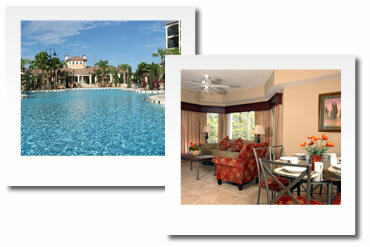 Holiday homes and condo rentals for rent Orlando, Florida. 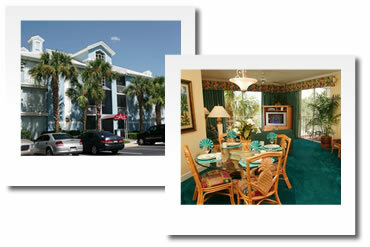 - 2 and 3 bedroom Condo Resort 5 minutes from Walt Disney World. 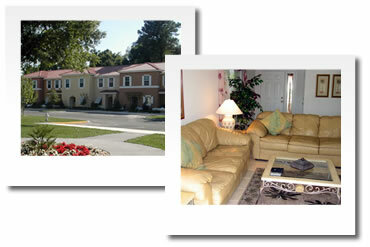 - All units have full kitchen, washer and dryer and balcony. 2 bedroom / 2 bath (sleeps 6 ) - Rates from USD89 per night incl taxes. 3 bedroom / 3 bath (sleeps 8) - Rates from USD105 per night incl taxes. 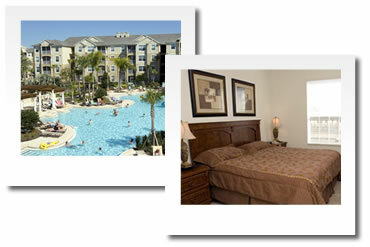 - 1 and 2 bedroom Suite Hotel 10 minutes from Walt Disney World. - All units have full kitchen. Full hot breakfast buffet included in rates. - Complimentary Scheduled transportation to Walt Disney World. 1 bedroom / bath (sleeps 3 adults or 2 adults and 2 children) - Rates from USD126per night incl taxes. 2 bedroom / 2 bath (sleeps 8) - Rates from USD174 per night incl taxes. 2 bedroom / 2 bath (sleeps 4) - Rates from USD149 per night incl taxes. 3 bedroom / 2 bath (sleeps 6) - Rates from USD179 per night incl taxes. 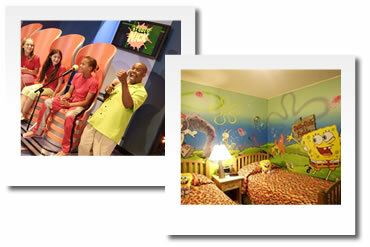 "The first and only Nickelodeon Hotel in the world - the dreamplace for your children". 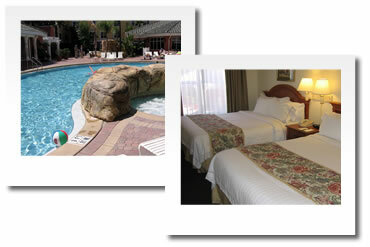 - 2 bedroom Kid Suites 10 minutes from Walt Disney World. - All rooms have kitchenette. - Scheduled shuttle bus to attraction parks. 2 bedroom / 1 bath Kid Suites(sleeps 6) - Rates from USD181 per night incl taxes. Address: International Drive South area, 14500 Continental Gateway, Orlando, FL 32821. - Fully-furnished, luxury condominium- style suites, with all the comfort and space of home. - One, two, three and four bedroom suites all with full kitchens, separate bedrooms & bathrooms. - Private balcony, in-room washer & dryer, complimentary Wi-Fi, safes, and much more. Universal Studios & Islands of Adventure. 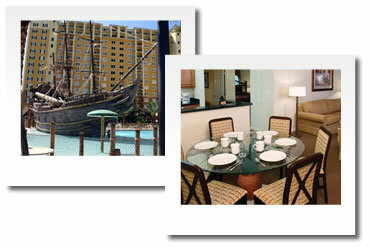 2 bedroom / 2 bath Condos (sleeps 6) - Rates from USD79 per night including taxes. 3 bedroom / 2 bath Townhomes (sleeps 8) - Rates from USD105 per night including taxes. - Rates from USD143 per night incl taxes. - Rates from USD161 per night incl taxes. 6 bedroom / 4 bath Superior Homes - Rates from USD223 per night incl taxes. 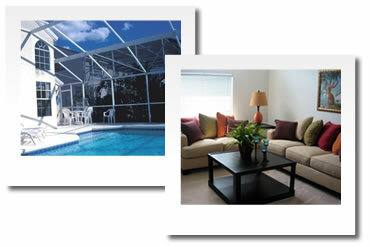 We offer a large variety of vacation homes in the Fort Myers area. 3 bedroom / 2 bath (sleeps 6) - Rates from USD129 per night incl taxes based on 4 night minimum stay. 3 bedroom / 2 bath (sleeps 8) - Rates from USD112 per night incl taxes. 4 bedroom / 2 (3) bath (sleeps 10) - Rates from USD126 per night incl taxes. 5 bedroom / 3 bath (sleeps 12)- Rates from USD141 per night incl taxes. For 7 bedrooms or more, please contact us for rate information.